Laura’s Gourmet Granola is chef created and artisan crafted with an equal focus on your health and your palate! Here’s the story of how this deliciously addictive granola went from being a passionate idea to an acclaimed product that you can eat straight out of the bag, on top of a salad or dozens of other delectable ways. Before she was a chef, Laura Gail Briscoe worked in the tech industry for some of the biggest names in the business. But like a lot of people, she burned out from the nonstop grind. Laura left high tech to pursue her true passion, beginning with culinary school. 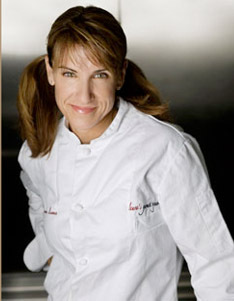 Not long after graduating, Laura started a catering company that grew into one of the Phoenix area’s top high end caterers and also led to her presenting regular cooking segments on local news and talk shows as Chef Laura. While she was busy catering corporate events and cooking on camera, Laura was constantly experimenting with a new granola recipe that could deliver the taste she’d loved since college but without all the fat, dairy and sugar. She recreated the recipe again and again, tinkering with the sugars and fats, documenting each adjustment, and ensuring she would design the blueprint to the perfect granola. All her hard work led to the birth of Vanilla Almond Crunch, the first of Laura’s Gourmet Granola’s SEVEN flavors. At first, Laura gave her granola away or included it in her catering events. But, it became so popular that she was urged to figure out how to bring Laura’s Gourmet Granola to market so that everyone could enjoy it. With nothing more than chutzpah, and a hundred bags of homemade granola, Laura started to visit grocery and specialty food stores all over Arizona. She walked the aisles, spoke with store managers and left samples everywhere she went. Finally, on a rainy day in May 2004, Laura serendipitously met (some say cornered) the owner of Arizona’s largest specialty retailer, who agreed to support her efforts to stock his stores’ shelves. Since then, Laura’s Gourmet Granola has grown into regional outlets for Whole Foods, Albertson’s, Safeway and Kroger, to name a few. As if that wasn’t enough, Laura’s Gourmet Granola has proven quite popular nationally as a foodservice option, gracing menus from Florida to Alaska. So, that’s the story of Laura’s Gourmet Granola! Can’t find it on a store shelf near you? Contact us and we’ll do whatever we can to bring its golden goodness closer to you. After all, you deserve to know “which flavor are you?”!